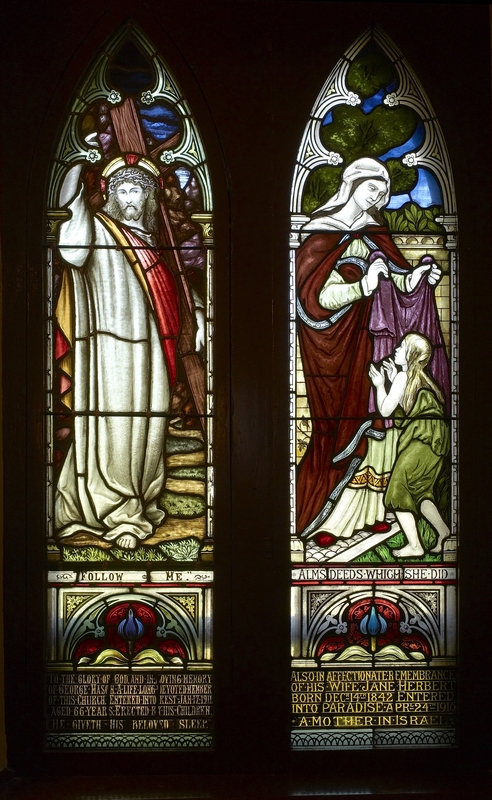 The eighteen magnificent stained glass windows are memorials dating from 1865. The windows and banners in Christ Church are all designed to lead you through the major events of the life of Christ as a teaching cycle. The windows are a microcosm of the liturgical cycle of the church. Every year the church follows Christ by remembering the events of His life by marking them with festivals and fasts such as Christmas and Lent. We believe that through this yearly cycle we engage more and more deeply with our story and thereby grow steadily in our faith throughout our lifetime. We seek to learn to love. To read the windows you will need to start with the South Nave window (Right Hand window next to the Organ) and move around the church clockwise. If I speak in the tongues of mortals and of angels, but do not have love, I am a noisy gong or a clanging cymbal. And if I have prophetic powers, and understand all mysteries and all knowledge, and if I have all faith, so as to remove mountains, but do not have love, I am nothing. If I give away all my possessions, and if I hand over my body so that I may boast,* but do not have love, I gain nothing. Love is patient; love is kind; love is not envious or boastful or arrogant or rude. It does not insist on its own way; it is not irritable or resentful; it does not rejoice in wrongdoing, but rejoices in the truth. It bears all things, believes all things, hopes all things, endures all things. Love never ends. But as for prophecies, they will come to an end; as for tongues, they will cease; as for knowledge, it will come to an end. For we know only in part, and we prophesy only in part; but when the complete comes, the partial will come to an end. When I was a child, I spoke like a child, I thought like a child, I reasoned like a child; when I became an adult, I put an end to childish ways. For now we see in a mirror, dimly,* but then we will see face to face. Now I know only in part; then I will know fully, even as I have been fully known. And now faith, hope, and love abide, these three; and the greatest of these is love. Given to the Glory of God and in loving memory of George Mason (1845-1911). Here you see Christ shouldering the Cross. You are being invited to meditate on the life of Christ through the stained glass windows of the church. It reminds all Christians that the only way to live the faith is to engage God and his world. Taking up the Cross and following him means that we must live our lives in reference to God and for something greater than our own small lives and comforts. This means embracing the joy of others as well as the suffering of the world. We open our hearts to love God and our neighbor as ourselves. This is how we follow him. Given to the Glory of God and in loving memory of Jane Herbert (1842-1916). 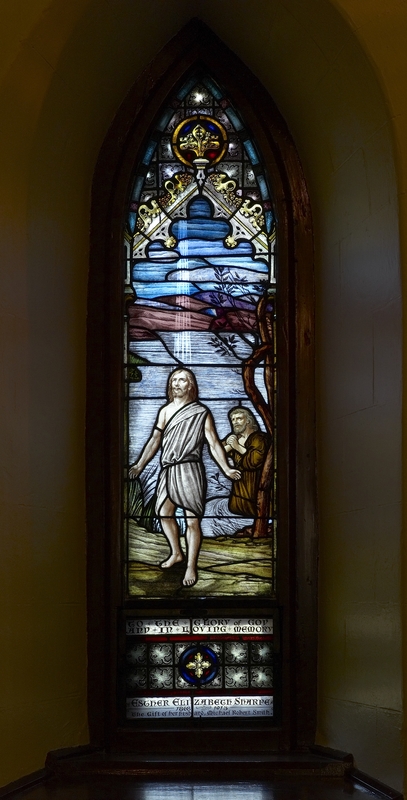 This window depicts a woman following the commandments of Christ. It shows the effect of a life lived by following Christ. It depicts the good deeds that flow out of discipleship. Once we engage in the sorrows and joys of our lives and in the lives of those around us our hearts are opened and we learn to love. It is because we love that we perform acts of compassion. The work of the church comes directly from our commitment to follow Christ that we make at Baptism and Confirmation. The response of our willingness to follow him is the receiving of the gifts of the Spirit. This window is a direct response to the previous window. For you were called to freedom, brothers and sisters; only do not use your freedom as an opportunity for self-indulgence, but through love become slaves to one another. For the whole law is summed up in a single commandment, ‘You shall love your neighbour as yourself.’ The fruit of the Spirit is love, joy, peace, patience, kindness, generosity, faithfulness, gentleness, and self-control. There is no law against such things. And those who belong to Christ Jesus have crucified the flesh with its passions and desires. If we live by the Spirit, let us also be guided by the Spirit. Given to the Glory of God and in loving memory of Robert Smith (1845-1916). This window depicts the beginning of the Incarnation, The Annunciation to the Blessed Virgin Mary by the Archangel Gabriel. Here we see the example of Mary’s submission to the divine will and her openness to God. We should reflect that it is only by opening ourselves to God that we become vehicles of grace, peace and love. Mary’s openness allowed the Messiah to enter into the world. St Paul tells us that we must die so that Christ will live in us. As Christians we are all to be like Mary so that, our will being given over to God’s will, may allow Christ to be born in us. Given to the Glory of God and in loving memory of Susanna Boyce (1850-1930). We then see The Nativity of Christ, commonly called Christmas, when the light of truth was born into the world. The creator of the universe was born into a world that did not know him. His presence in the manger, surrounded by his mother and Saint Joseph, reminds us that the power of God does not conform to our standards. He did not come with strength or earthly power, he came in poverty and weakness and vulnerability. “My ways are not your ways, saith the Lord”. Given to the Glory of God and in loving memory of John Herbert (1829-1918) and Ann Hamilton (1836-1922). Given to the Glory of God and in loving memory of John Kirkwood (1844-1914) and Suzanne Parkinson (1851-1919). This is an interesting window as it does not depict any particular scene in the life of Christ as a youth, such as the finding in the Temple. It reflects the innocents and joyfulness of youth. The lack of many stories about Christ in his younger days helps us reflect that it takes many years to grow in the faith and that the years we spend wrestling and learning are only the preparation for the engagement in the life of faith reflected through our actions. It also helps us realize how important it is to raise our children in love and without fear so that they may comes to the “full stature of Christ”. Given to the Glory of God and in loving memory of Esther Elizabeth Sharpe (1868-1913). On the right hand side at the back of the Church you see The Baptism of Christ by Saint John the Baptist. The window is placed near the traditional place of the Font. The Font is near the entrance to the church to symbolize that it is through the waters of Baptism that we enter into the Church, the body of Christ on earth. We are baptised into the death and Resurrection of Christ in which we die to the life lived for our own pleasure, power and desires and rise again to a life lived for the greater plan of the Kingdom of God. Given to the Glory of God and in loving memory of Francis Morgan (1811-1901). On the opposite side of the nave we see a depiction of Christ in the Wilderness. 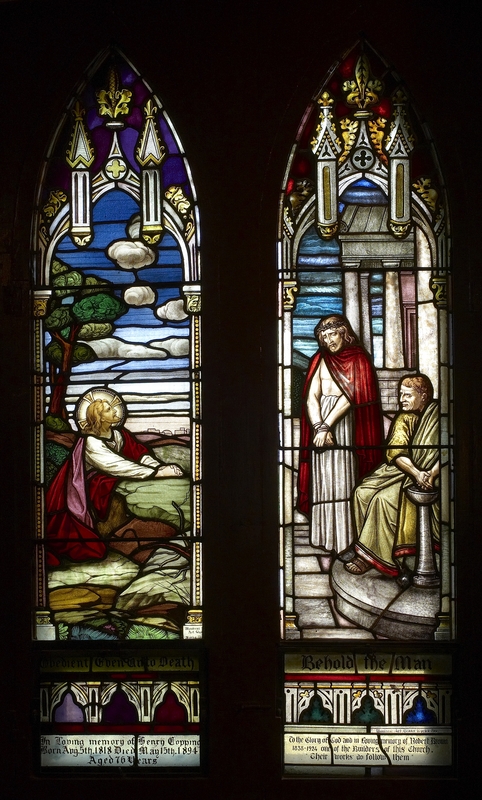 These two windows compliment one another well as they point to the fact that immediately after his Baptism Christ was driven into the wilderness by the Holy Ghost to be tempted before he began his public ministry. It is a spiritual truth that new birth and growth is beset by temptation and trial. We reflect on this window during the penitential season of Lent which begins on Ash Wednesday. We begin the season with the words “remember man that thou art dust and unto dust shalt thou return, repent and believe in the Gospel.” This is the message that the church has proclaimed to the world throughout the centuries. Remember you only live this one life and therefore every day is important and precious. We will all one day die so we must make our lives count. Turn again from fruitless paths of seeking power, riches and the desires of the flesh and turn to the Good News (Gospel) of life and live. Given to the Glory of God and in loving memory of Robert, Mary and Able by the Venerable R.C. Blagrave, D.D., sometime Archdeacon of Peterbourgh, Ontario. 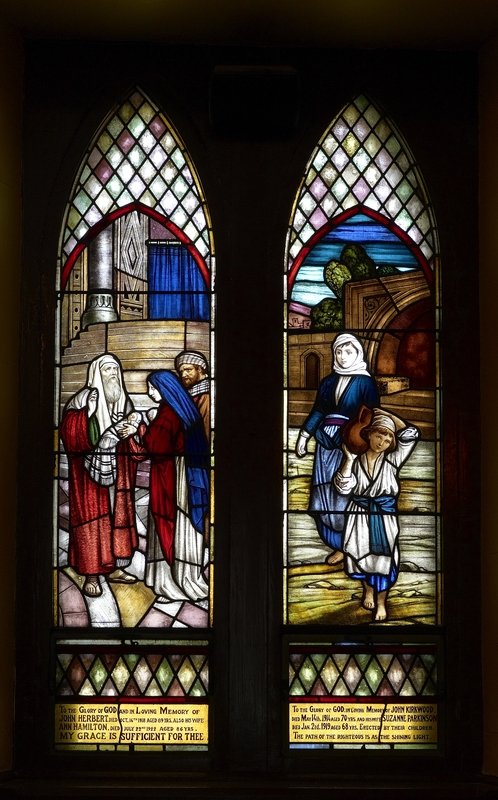 This window depicts the first of Christ’s miracles at the wedding feast in Canna of Galilee;. his changing of water into wine. This miracle foreshadows the mystery of the Eucharist. In the Eucharist, the sacrament given to the church by Christ at the last supper, we fulfill his command to this in remembrance of him until he comes again. The word remembrance in Greek does not mean to remember something that has happened in the past but rather means to go back and make it real again. In the Eucharist the church wills itself to see beyond the normal barriers of space and time and to enter eternity, God’s time. Eternity is not something opposed to time but rather lies underneath it. When we sing the Sanctus at the beginning of the Eucharist we enter with the whole company of the Saints and angels to join our song with that of all of the creation to move from this perception of reality, in which everything changes, to the reality of God “who was in the beginning, is now and ever shall be world without end.” The bread and wine become for us the Body and Blood of Christ as we perceive the eternal incarnation of God in his creation in the sacrament he gave us. Given to the Glory of God and in loving memory of Charles Gray and Elizabeth Scroogie. This depicts the Transfiguration of Christ. Depicted in the background are Moses and Elijah while in the foreground are Saint Peter, Saint James and Saint John. Here Christ is recognized and witnessed to by God the Father. The Transfiguration, like the Annunciation, reminds us that the goal of a Christian’s life is to be transfigured so that God will dwell in our hearts and uses all of our actions for his will. “God uses all things for the good of those who love Him.” The Transfiguration also helps us recognize that there are moments in life in which the world is illuminated and we see clearly. It also reminds us that we can not live on the mountaintop, that life is mostly made up of the simple recognition of God in our relationships to one another. The transfigured moments are given to suffuse our everyday life with meaning. We attend church week by week to remind us of why we do what we do and to continually remind us of who we are. The service end with a sending forth into the world. This reminds us that the real work of the church is lived out after we leave the church on Sunday. Given to the Glory of God and in loving memory of Elizabeth Copping (1840-1900). 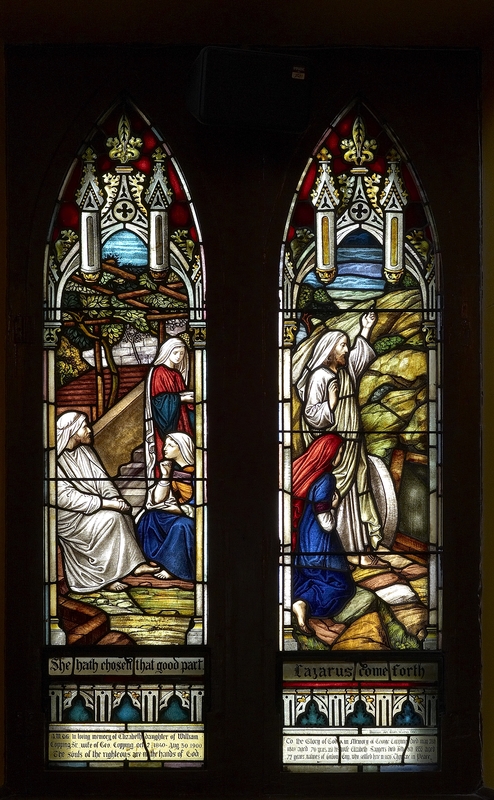 The window to the right depicts the teaching of Christ to Mary and Martha and contemplates the difference between serving and listening. Many people in this world spends too much of their time ‘doing’ instead of ‘being’. These must be balanced, but Christ reminds us that without the ‘being’ the ‘doing’ is not enough. We must take the time to be quiet and reflect on our actions and work. We need to keep a Sabbath day. If our lives are always rushed and anxious we lose ourselves in the chaos. We need to learn to stand still. We are saved through Grace and not works. It is not what is good that is important but what is best as Mary saw. Given to the Glory of God and in loving memory of George Copping (1779-1849). Given to the Glory of God and in loving memory of Elizabeth Saggers (1780-1852) and Henry Copping (1818-1894). Given to the Glory of God and in loving memory of Robert Brown (1838-1924), one of the builders of the present church. Given to the Glory of God and in loving memory of the Rev’d William Davis (1840-1915) Incumbent of this parish from 1884-1912. 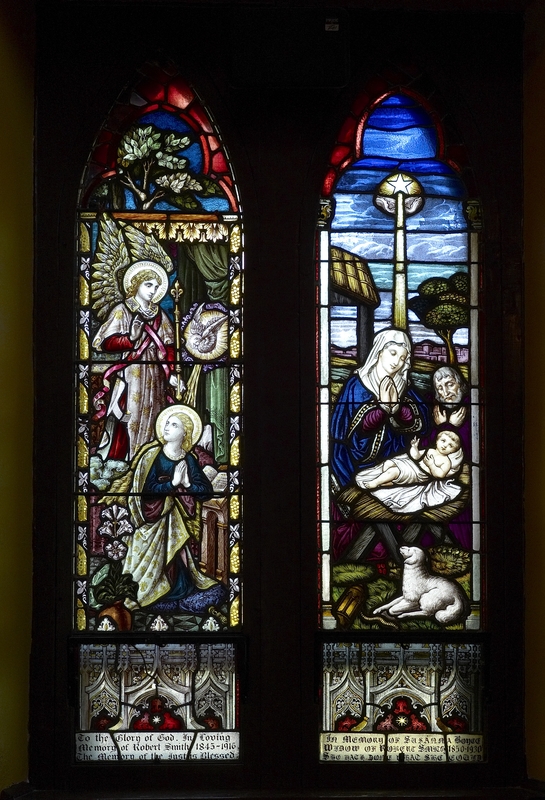 The two penultimate windows are the central themes of the entire Christian life. Everything else is simply a working out of the death and resurrection of Christ in our own lives. Behind the altar on the left is the Crucifixion of Christ. It emphasises the essential truth that it is only through the cross that one can come to resurrection. Without Good Friday there is never Easter. When we avoid the suffering and discomfort that pushes us to grow and opens our hearts to compassion there is no new life. In medieval churches the rood cross, which hangs from the ceiling, is located at the chancel steps. On the one side is the figure of the crucified Christ. However after you have gone up for communion and you turn to go back to your seat the back of cross has no figure but rather Easter lilies. The darkest hour is just before dawn. Given to the Glory of God and in loving memory of The Rev’d William Seaborn (1828-1913) Incumbent of this parish from 1865-1879. On the far left is the Resurrection of Christ. The Crucifixion and Resurrection are on opposite sides and at the front of the church to show that both are different sides of the same truth and that this understanding is central to the life of a Christian. Neither has meaning without the other, all things that are born die. But death itself dies and is reborn into eternal life. In eternity there is no past or present, no I and Thou, but only one unbroken “I Am”. Part of the mystery of the passion and resurrection of Christ is that eternity and everlasting life, the Kingdom, has already come. The Resurrection is the ultimate sign of redemption for the world. That after fear and death there is love and life. Let us remember what the angel said to us at the empty tomb “why seek ye the living amongst the dead”. We find Christ not in history or anywhere else than in the eternal present moment as he is revealed to us over and over again in his Resurrected life. Let us also remember what he said to us when He rose “Be not afraid.” Alleluia. Given to the Glory of God and in loving memory of the Rev’d Charles Rollit (1810-1885) Incumbent of this parish from 1846-1865. 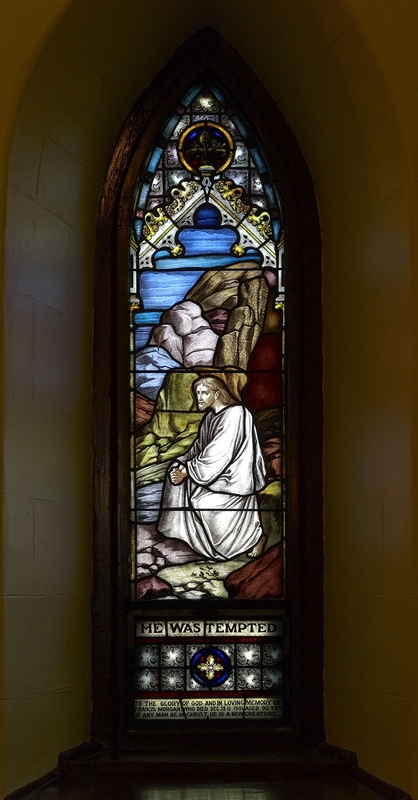 The Central window depicts Christ as the Good Shepherd, one of the most popular images that Christ gives of himself. It is the window of the patronage of the Church, Christ Church. The image of the Good Shepherd reminds us of the faithfulness and love of God. He will never leave us and he will never cease trying to find us and bring us home no matter how far we stray from the fold. It also reminds the church that we exist not for ourselves but for those who have yet to join us. Above and below the Good Shepherd are the depictions of the two great Sacraments of the Church; Baptism, depicted by a font, and the Holy Eucharist (Holy Communion, The Liturgy, or the Mass) depicted by a chalice. Given to the Glory of God and in loving memory of the faithful departed of the parish by the Christ Church Memorial Fund. 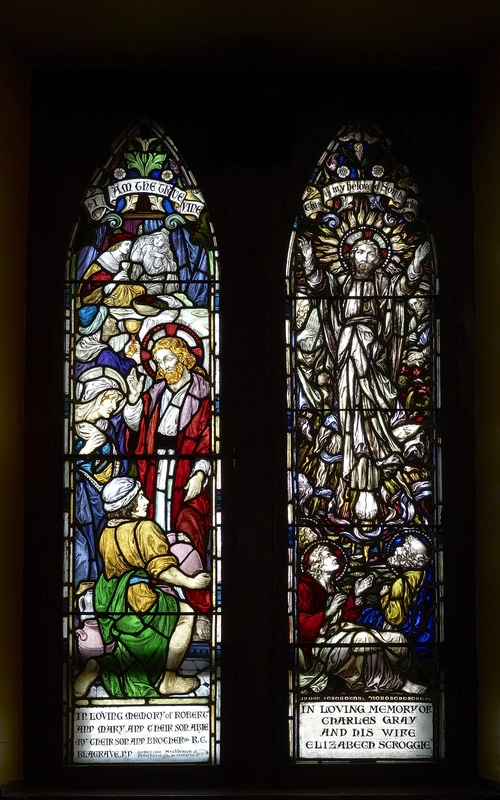 The stained glass window end with the Resurrection of Christ. The other two events in the story of salvation are depicted by two banners. The first banner, located on the right hand side of the church (facing the altar), is the Ascension banner. 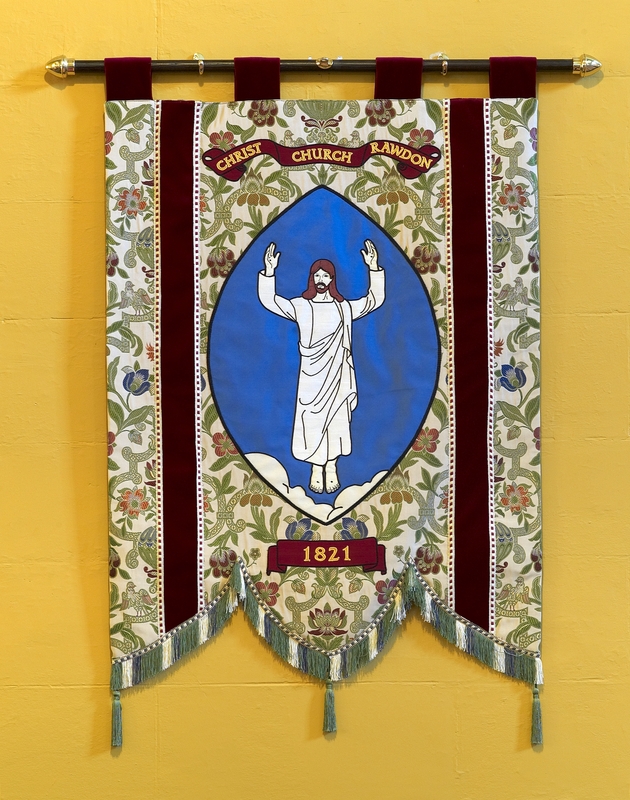 This banner depicts Christ Ascending after the forty days spend on earth after the Resurrection. The holes in his hands and feet are still there emphasizing that Christ’s experience of suffering humanity is retained after his Ascension. This banner is the Parish Banner. The banner on the opposite side of the Church from the Ascension banner is the Pentecost Banner. 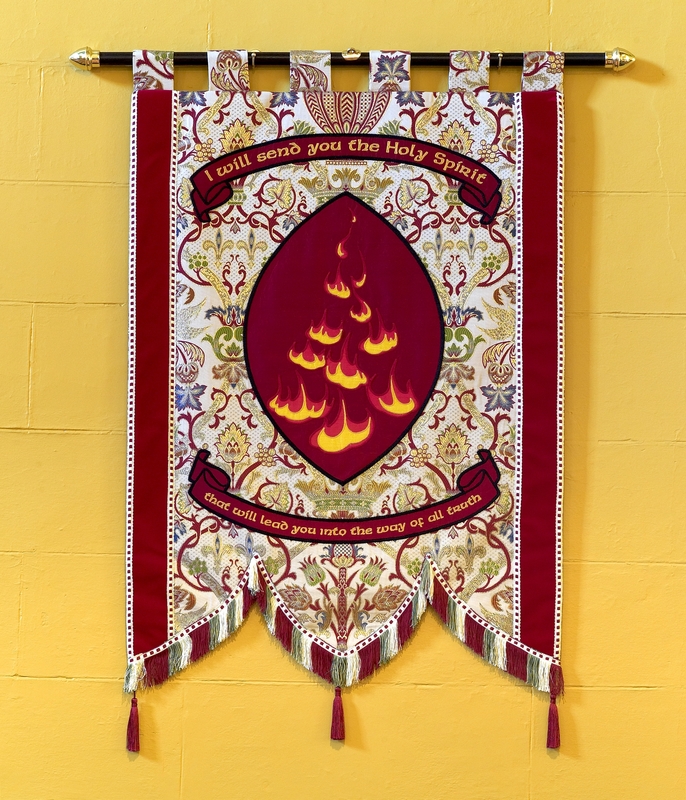 The twelve tongues of flame represent the sending of the Holy Spirit on the Apostles after the Ascension of Christ. The sending of the spirit to “Lead us into the Way of All Truth” is the beginning, the birthday, of the Christian Church. The Church now exists in the age of the Holy Spirit. We believe that it is the Spirit who guides us as we grow in the understanding of Scripture and the mission of the universal church. It is the spirit who gives the gifts of wisdom, discernment and love. It the Spirit who leads us on the path, or as the church was known in the beginning, The Way. ‘I still have many things to say to you, but you cannot bear them now. When the Spirit of truth comes, he will guide you into all the truth; for he will not speak on his own, but will speak whatever he hears, and he will declare to you the things that are to come. Dedicated by the Archbishop of Montreal on May 7th 2002. 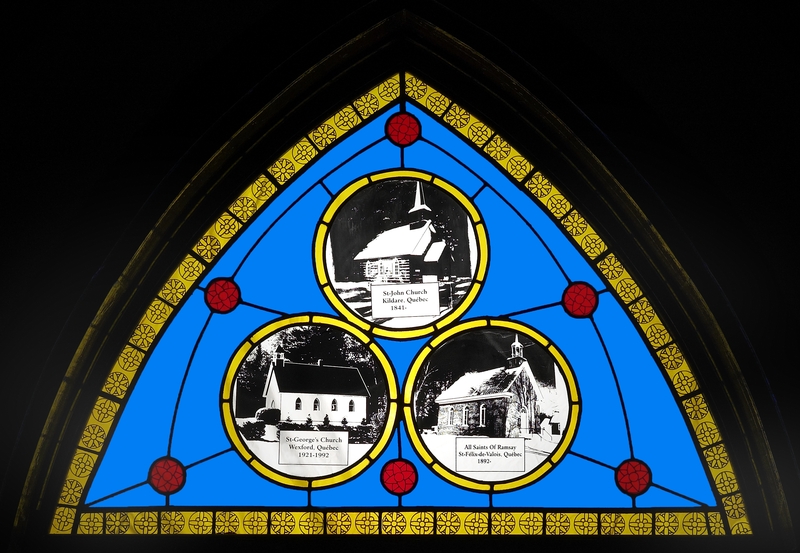 The window leading to the porch depicts the other three churches that historically made up the Parish. The three churches are: All Saints’, de Ramsey; St John’s, Kildare; and St George’s, Wexford. Please see the history section for more information on these churches.